KISSIMMEE, Fla. (March 26, 2012) — Two U.S. Army World Class Athlete Program wrestlers over the weekend qualified their Greco-Roman weight classes for Team USA to compete in the 2012 Olympic Games. Sgt. 1st Class Dremiel Byers and Sgt. Spenser Mango accomplished their mission by reaching the finals at the FILA Pan American Olympic Games Qualifying Tournament March 23-25, at Silver Spurs Arena. 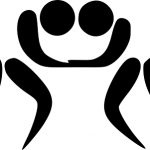 The tournament featured wrestlers from 17 nations who had not qualified for the 2012 Olympics. The top two finishers in each weight class qualified their country for the London Olympic Games in August. Byers, 37, a 2008 Olympian from Kings Mountain, N.C., won the 120-kilogram/264.5-pound division with three consecutive victories without allowing his opponents to score a point. Byers defeated Canada’s Sunny Dhinsa, 1-0, 3-0, and Dominican Republic’s Ramon Garcia, 2-0, 1-0, before sweeping Venezuela’s Andres Ayub, 2-0, 2-0, for the gold medal. “It might not be pretty, but qualify the weight class for the Olympic Games. That’s big pressure, so I’m just proud that Byers and Mango both got it done,” said WCAP wrestling coach Shon Lewis. Mango, 25, a 2008 Olympian from St. Louis, Mo., took the silver medal at 55 kilos/121 pounds. He defeated Ecuador’s Mayea Figueroa, 5-0, 1-0, and Colombia’s Andres Taborda, 1-0, 1-0, before losing to Javier Gonzalez of Cuba in his final match of the round-robin format. Byers and Mango will be joined by most of their WCAP teammates at the 2012 U.S. Olympic Team Trials for Wrestling April 20-22 at Carver Hawkeye Arena in Iowa City, Iowa, where Team USA will be determined for the London Games.